Be the first to review this 2019 INFINITI QX60. No matter how crowded the crossover SUV field gets, there’s plenty of room for three-row luxury vehicles such as the 2019 Infiniti QX60, a veteran of its lineup for six model years. The QX60 slots above the mid-size QX50 in the lineup, but it’s smaller than the truck-based QX80 SUV. Making automatic emergency braking standard for the 2019 model year adds to the QX60’s benefits for family-focused buyers. Standard safety equipment also includes blind-spot monitors with pedestrian detection, and forward-collision warnings. Nissan’s luxury division has added active lane control and blind-spot monitors to the ProAssist driver-assistance package, which also includes adaptive cruise control and lane-departure warnings. A newly available Limited option package loads Infiniti’s second-largest utility vehicle with just about every available feature, but adds plenty to the selling price. The Limited package itself, with interior and exterior enhancements, costs $5,000; four other option groups must be purchased first, bringing the total for the Limited to nearly $17,000 more than the base price. All QX60s are powered by Infiniti’s familiar 3.5-liter V-6 engine, producing 295 horsepower and 270 pound-feet of torque. It mates with a continuously variable transmission (CVT). Front-wheel drive is standard, but all-wheel drive is available for an additional $1,800. A QX60 is capable of towing as much as 5,000 pounds – quite a load for a family crossover. The Insurance Institute for Highway Safety gave the 2019 QX60 "Good" ratings for nearly all crash tests, but judged it only "Acceptable" for passenger-side small-overlap crash protection. A "Marginal" rating for headlights disqualified it for Top Safety Pick consideration, but frontal crash prevention was deemed “Superior” (with optional equipment installed). Blind-spot monitors, standard even on base versions, are most welcome because of the QX60’s limited rearward vision. Prices do not include the $995 destination charge. Pure ($44,250) has front-wheel drive and is equipped with 18-inch wheels, synthetic leather upholstery, heated front seats, six USB charge ports, blind-spot monitors, automatic emergency braking, and an 8.0-inch infotainment screen. No options are offered. Pure AWD ($46,050) gets all-wheel drive. Luxe ($46,050) has front-drive and adds a heated steering wheel, memory system, Bose 13-speaker audio, and remote start. Rear-seat entertainment, leather upholstery, adaptive cruise control and active lane control are optional, bundled into high-dollar packages. Luxe AWD ($47,850) has all-wheel drive. Sharp but subtle elegance helps the QX60 remain competitive against newer-looking crossovers and SUVs. Not only does the stately design look good, it’s aged well. The QX60 also conceals its bulk effectively. Only when parked next to a compact crossover does its 4,500-pound heft become evident. What might be dubbed a “puckered” grille is flanked by headlights that frame its floating badge. Long chrome bodyside strips lead to a graceful, crescent-shaped kickback. A gentle slope keeps the roofline from appearing too aggressive. All the way back, a gentle curve helps shape the tailgate. Packed with knobs and switches, the cabin might seem cluttered, but it provides seating comfort for five occupants in the front and second rows. High-quality materials offset any minor disturbances to the eye, though some observers might wonder if an analog clock is still appropriate. Throughout middle America, three-row crossovers have become satisfying replacements for the increasingly-outmoded minivan. Although Infiniti’s QX60 is on the smallish side in its category, any dimensional demerits are offset by luxury appointments. Related to Nissan’s Pathfinder, the QX60 gets higher-quality finishes. Even the base model is pleasant and tough with its synthetic leather upholstery, while top trim levels blend leather and wood with soft-touch surfaces. First-class first- and second-row seats promise considerable comfort, but the third row is somewhat cramped. In addition to flat-bottom seats, the back row offers a mere 30.8 inches of legroom. In that respect, the QX60 trails such rivals as the Honda Pilot and Acura MDX. The second row slides fore/aft by 5.5 inches, providing ample legroom as well as suitable access to the third row. When the QX60 is fully packed with passengers, cargo space ranks only as adequate, with 16.6 cubic feet behind the back row. Fold the third-row seatbacks, and volume expands to a more appropriate 40.5 cubic feet. With second-row seatbacks down, the total grows to 76.5 cubic feet. In the family crossover category, sailing down the middle of the road in every respect is a benefit, not a drawback. Few owners are likely to feel deprived by a shortage of horsepower, as long as they get an easygoing, even gentle, ride. A quiet, well-composed ride can definitely be anticipated in the QX60. Even with tall 19-inch tires, the roadgoing experience leans toward the serene. Handling is predictable, though steering is on the vague side. Selecting sport mode doesn’t change steering feel much, but it deactivates the “EcoPedal” setup that seems to push back when you push hard on the accelerator pedal. It’s a fuel-efficiency helper. Though unobtrusive in its operation, the CVT keeps the engine at moderate engine speeds while it accelerates. That led Infiniti to add active noise cancellation to quell its noise. Despite being around for some years, the QX60 remains fuel-efficient among luxury three-row crossovers. With all-wheel drive, it’s EPA-rated at 19/26 mpg City/Highway, or 22 mpg Combined. Front-wheel drive is only a touch thriftier, EPA-rated at 20/27/22 mpg. Premium gasoline is required. 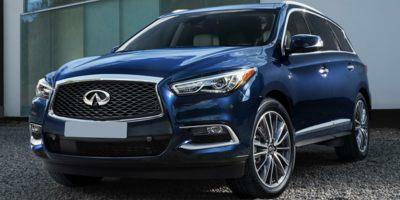 Competent and reasonably luxurious, the 2019 Infiniti QX60 attracts buyers based upon its subtle style, which it couples with safety technology and abundant standard equipment. The best value is the step-up Luxe edition, which provides plenty of family-friendly features. 2019 INFINITI listings within 25 miles of your ZIP code. Find 2019 INFINITI listings for sale near you.